However, as described above Polyurea are a much more advanced polymer and offer numerous performance benefits including cure time. The cost factor is often offset by the amount of time, labor and related downtime costs associated with other polymer based coatings. This is especially important for commercial applications where a company may need to shut down business while the floor coating is installed. 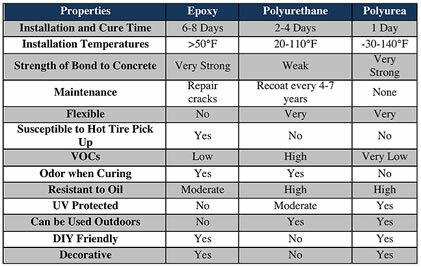 When homeowners install a Polyurea floor coating in residential garages, they will not need temporary storage for their items kept in the garage like they would need if using other slower-curing polymer coatings.